By November 14, 1775, when John Murray, Earl of Dunmore and royal governor of Virginia, issued his proclamation, his plan to offer freedom to slaves who would leave their patriot masters and join the royal forces was already well underway. Dunmore understood that such an act would have a wide-ranging effect. Not only would it disrupt production, it was also feed the growing fear among the colonists of armed slave insurrections. Planters would be distracted from waging war against Britain by the necessity of protecting their families and property from an internal threat. At the same time, Dunmore's own force of 300 soldiers, seamen and loyalist recruits, cut off from the support of British troops in Boston, would be reinforced by black fighting men and laborers. Word of Dunmore's plan was known as early as April, when a group of slaves presented themselves to him to volunteer their services. He delayed the decision by ordering them away, but the Virginia slaveholders' suspicions were not allayed. On June 8, 1775, Dunmore left Williamsburg, taking refuge aboard the man-of-war Fowey at Yorktown. Over the next five months, he reinforced his troops by engaging in a series of raids and inviting slaves aboard the ship. On November 7, Dunmore drafted a proclamation, and a week later he ordered its publication. It declared martial law and adjudged the patriots as traitors to the Crown; more importantly, it declared "all indented servants, Negroes, or others...free that are able and willing to bear arms..."
Response from the colonists was immediate. Newspapers published the proclamation in full, and patrols on land and water were intensified. Throughout the colonies, restrictions on slave meetings were tightened. The Virginia Gazette warned slaves to "Be not then...tempted by the proclamation to ruin your selves" and urged them to "cling to their kind masters," citing the fact that Dunmore himself was a slave holder. In December, the Virginia Convention issued its own proclamation as a broadside, declaring that runaways to the British would be pardoned if they returned in ten days, but would be severely punished if they did not. The document began with a reminder of the penalty for slave insurrection -- death without benefit of clergy -- though in practice, it was used sparingly during the war. By then, 300 black men had been inducted into "Lord Dunmore's Ethiopian Regiment," armed, and outfitted in military uniforms inscribed with the words "Liberty to Slaves." By early June, however, Dunmore's forces had been decimated by smallpox and the patriot's defenses. In August, the British destroyed over half of their own ships and sailed out of the Potomac, taking the 300 healthiest blacks with them. 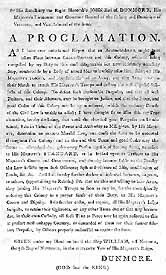 Although probably no more than 800 slaves actually succeeded in reaching Dunmore's lines, word of the proclamation inspired as many as 100,000 to risk everything in an effort to be free.